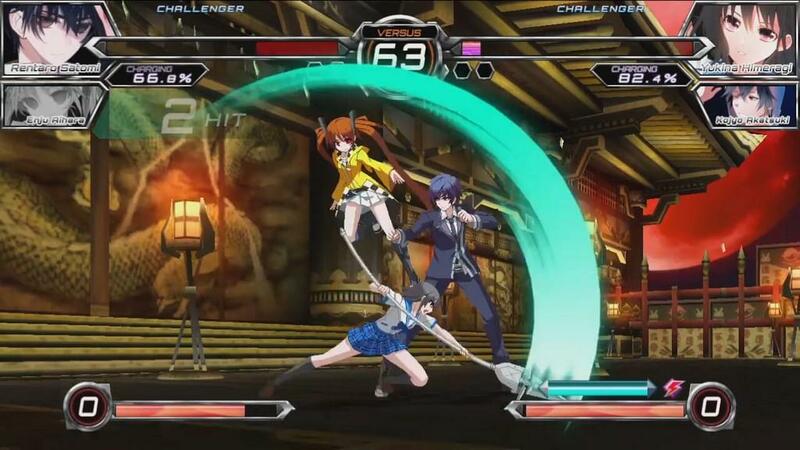 Celebrating twenty years of media publishing, Dengeki Bunko has a number of titles within its media empire, and now with the help of SEGA and Ecole Software we’ve got Dengeki Bunko: Fighting Climax, giving players the ability to battle with some of their favorite characters of recent anime and manga fame. 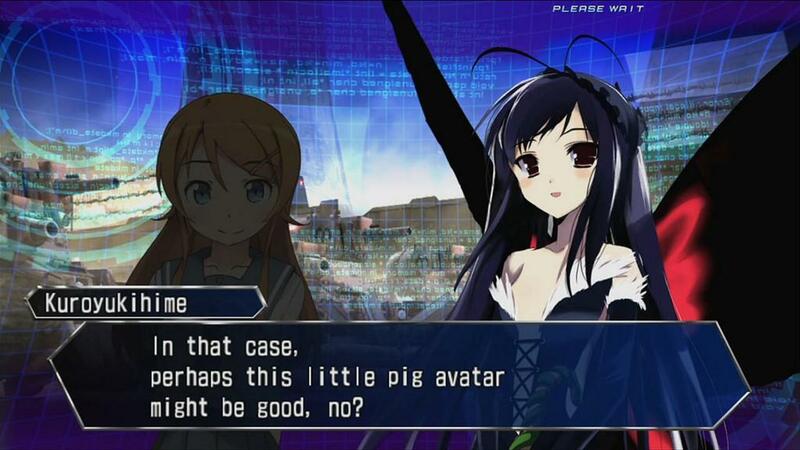 With Street Fighter 4 Ultra starting to ride off into the sunset, and the Vita being devoid of a solid fighting game, Dengeki Bunko: Fighting Climax is filling in quite the void for Sony’s portable console. Given the pedigree of Ecole Software and their experience with the Melty Blood franchise, it’s expected that this game would be of the same quality, and thankfully they have not disappointed in the slightest. Fighting Climax’s story isn’t all that big a deal, there’s the evil force Zetsumu that has taken people from the different universes and subjugated their powers, giving him the ability to crush the dreams of other worlds and destroy Denshin, the guardian of those dreams. Like I said, not incredibly deep, but it gets the job done. Everyone’s story will end pretty much the same way, but completing the story mode will unlock some new characters that can be used in versus mode and for online play, so it is worth doing at least once or twice. The gameplay is your standard best two out of three round affair. You’ve got a light, medium, and strong attack, special moves that are your standard quarter circle forward or back motions, and super moves that dole out massive damage in exchange for meter. Support characters can be called into battle and do a variety of things, from simple attacks to extend combos, to restoring lost health, there’s a perfect combination of fighter and support out there for everyone and for every situation. It’s really easy to jump in and just fool around for a bit, but if you want to seriously master this game then expect to put in a lot of work, without much assistance from the game itself. Sega has been regularly releasing combo videos and for the life of me I can’t figure out the timing for some of them. But it has given me ideas of combos that I am more capable of pulling off on a regular basis. There is also local network play along with online battles via PSN, although during the review process the number of players available was next to nothing, making it incredibly difficult to find someone to battle. Additional modes include a score attack mode, time attack, and survival, with online leaderboards that you can submit your scores to. Then you have your requisite training mode. I kind of wished there was a better experience for the challenge modes, as it’s quite common to have a mode dedicated to learning combos and gameplay elements via a guided experience. It’s not a deal breaker, but it is disappointing. The training mode will serve you well though as you learn the ins and outs of the combo system. You can also customize your experience in little ways, whether it be by altering the color schemes of your support characters, or by changing how your title display card appears for online matches. 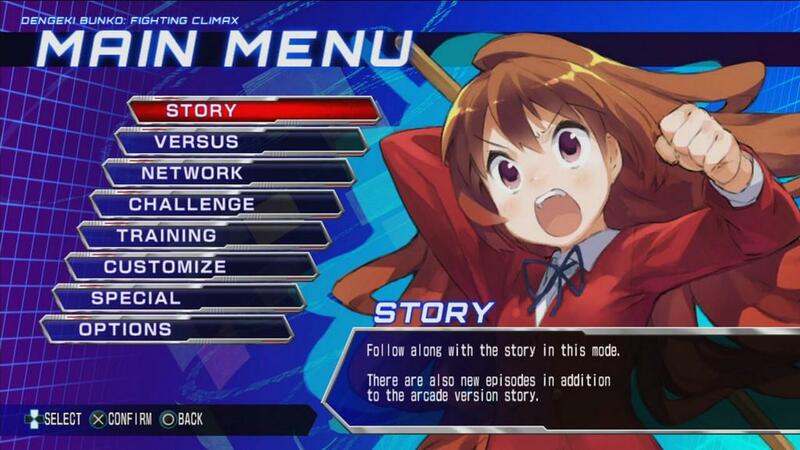 As you clear the story and use other characters, they become unlocked in the Special menu where you can view their information, and unlock voice packs. The amount of content related to these characters is pretty staggering and has me interested in their respective series a bit more now. Visually Fighting Climax has some pretty decent sprite-work, that has definitely been scaled down for display on the Vita. This means there is a little bit of aliasing on the sprites themselves, but the game runs at a smooth frame-rate, so the trade-off is mostly worth it. The backgrounds of each stage are full of homages to the various Sega properties out there, including stuff from Sonic the Hedgehog, NiGHTS, and Phantasy Star Online. This game feels like a love letter to all the properties involved and it’s good to see Ecole Software giving it its just due. 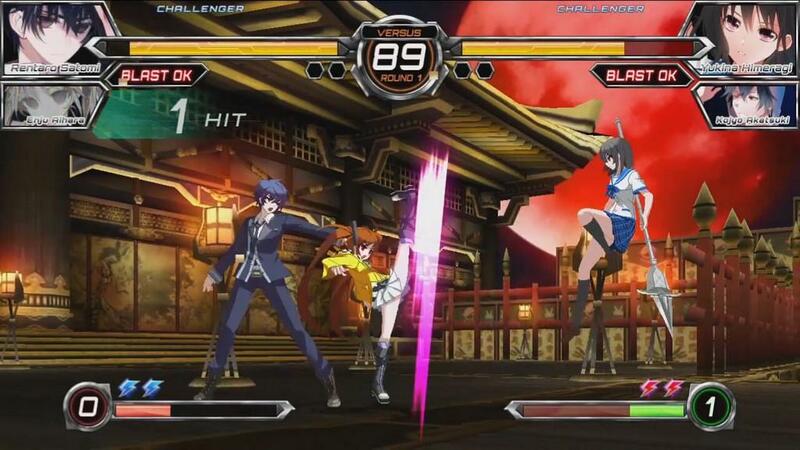 Dengeki Bunko: Fighting Climax is definitely a ton of fun. The fighting portion is crisp and snappy, and it doesn’t take a lot of initial effort to just get in and have fun. The real challenge is obviously going to come from ranked play, and adjusting for any network latency. The amount of extra content feels just right, and though it’s a little grindy to unlock it all, it won’t take more than a few hours of solid playing. The Vita has been kind of devoid of a solid fighting game for quite a while now, and I’m glad Sega and Ecole Software have been able to give me a good portable option for on the go fighting. 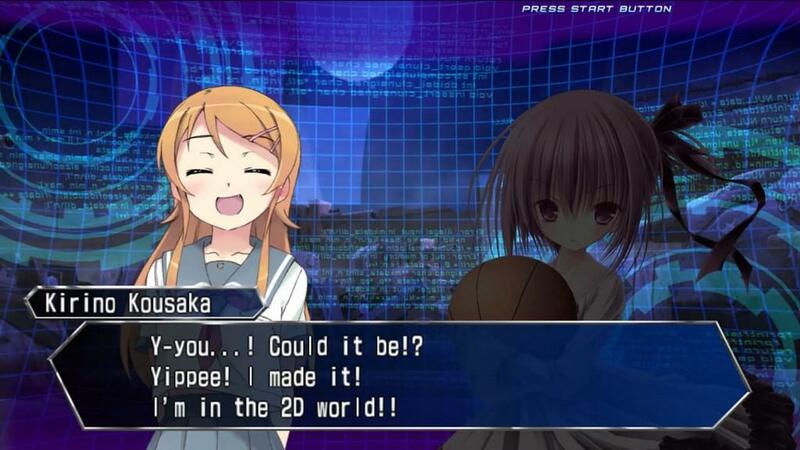 I’ve long since moved on from Marvel vs Capcom 3, and Street Fighter x Tekken, and Dengeki Bunko: Fighting Climax provides a refreshing experience for on-the-go brawling. 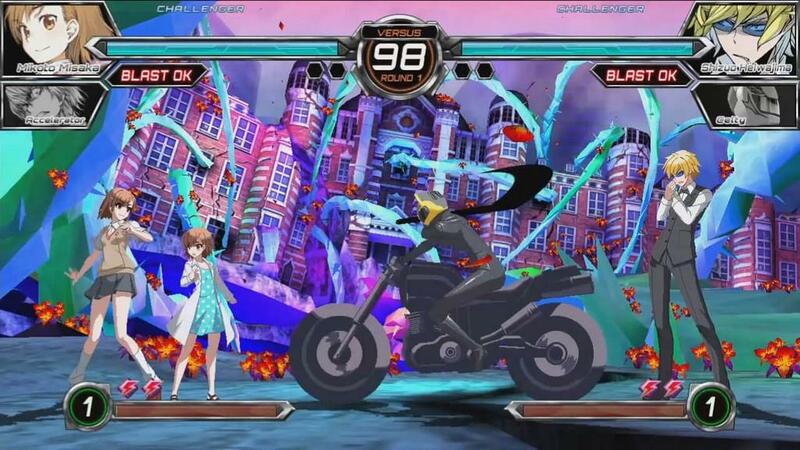 Dengeki Bunko: Fighting Climax may have suffered a little in the transition to Vita from a visual standpoint. 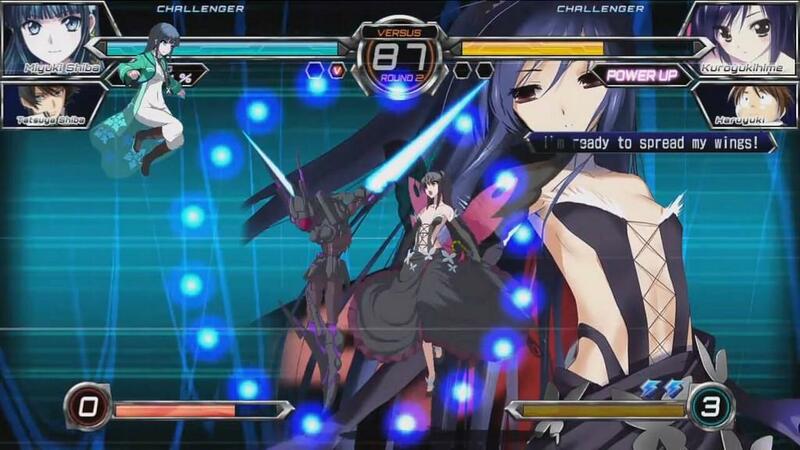 But the gameplay is certainly on point and fighting game fans finally have a reason to turn on their Vita again.